I’ve written a lot over the past year about women composers in Hollywood. Let’s not forget the ones who are contributing great work to film, but aren’t in L.A.! 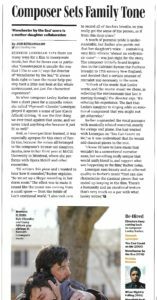 One of the year’s most riveting and powerful films is Manchester by the Sea, and for a story in this week’s Variety I interviewed both Toronto-based composer Lesley Barber and director Kenneth Lonergan. Lonergan, who previously worked with Barber on You Can Count on Me, offered some fascinating insights, and Barber revealed some especially interesting, family-related details about the voices we hear in her score. This entry was posted in Composers, Film Music, Interviews and tagged Jacoba Barber-Rozema, Kenneth Lonergan, Lesley Barber, Manchester by the Sea, Plymouth Chorale, Variety on November 25, 2016 by Jon Burlingame. The year’s Oscar music race begins! While the general public may not be thinking about Oscars this early in the year, the reality is that awards season is already well underway in Hollywood. Screenings of November-December releases are in full swing, awards consultants are emailing and phoning, and Variety has begun its coverage of potential honorees. Here is the backstory of the music of La La Land, certain to be one of the most talked-about late-year releases. I was fascinated by what initially inspired composer Justin Hurwitz and director Damien Chazelle to create this magical movie. 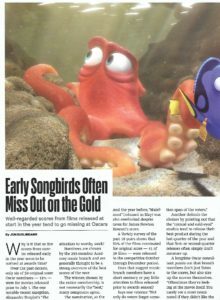 Also in the Nov. 1 issue, I explore why so few spring and early-summer films are ever nominated for their music; and offer a detailed look at the unusual South Pacific music of Disney’s upcoming Moana, including an interview with Hamilton composer Lin-Manuel Miranda. 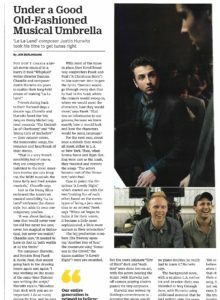 This entry was posted in Composers, Film Music, Interviews and tagged Damien Chazelle, Disney's Moana, Justin Hurwitz, La La Land, Lin-Manuel Miranda, Mark Mancina, Moana, Opetaia Foa'i, Oscar contenders, Oscar music, Oscar race 2016, Variety on November 1, 2016 by Jon Burlingame. 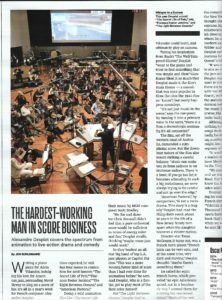 I love the headline on the print version of my Variety story about French composer Alexandre Desplat — the 2014 Oscar winner for The Grand Budapest Hotel — and his four alternately dramatic and delightful scores for major films this year: “The Hardest-Working Man in Score Business.” Desplat created a fun jazz backdrop for The Secret Life of Pets; a powerful, evocative dramatic score (including a piano piece actually played by Alicia Vikander) for The Light Between Oceans; a dark and moody Americana ambiance for American Pastoral; and a clever ’40s-jazz flavor for Florence Foster Jenkins. He even convinced Meryl Streep to sing (on key, unlike the real Ms. Jenkins) on that last one! This entry was posted in Composers, Film Music, Interviews and tagged Alexandre Desplat, Alicia Vikander piano, American Pastoral, Florence Foster Jenkins, Meryl Streep sings, The Light Between Oceans, The Secret Life of Pets, Variety on November 1, 2016 by Jon Burlingame.